Salah 3D Islam Pro - Islamic Apps Series based off Quran/Koran Hadith from Prophet Muhammad and Allah for Muslims! 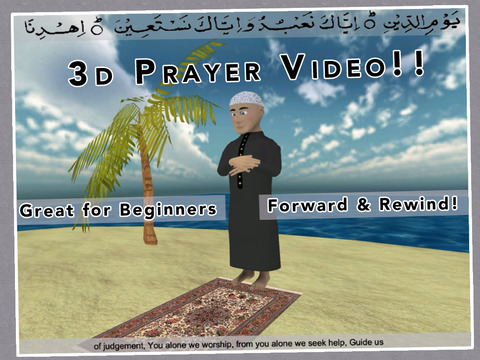 Salah 3D is a great way to learn how to pray salah! Whether you're an adult wanting to learn, or maybe you're looking for a way to teach your children namaz , a Revert/convert to Islam or even just someone wanting to brush up on how you should be praying - Salah 3d is for you! ∙ TAP the Arabic words to HEAR RECITATION! - A must for BEGINNERS! ∙ WUDU guide - must be performed before praying! ∙ 3D Salah Animation – Watch a 3d animation of how to perform the prayer ! Ever heard the azan or been in a mosque and not sure what to do? This app teaches Salat/namaz in two ways, our Book Mode has the Salah prayer broken down into small easy to follow steps. Worried about not being able to read Arabic very well? Don't be! The TRANSLITERATION feature could be just for you! Not only that we have take things even further, you can also click on the Arabic words in the book mode to HEAR a professional RECITATION - great for BEGINNERS! Salat is even mentioned in important hadith such as Bukhari and Sahih muslim so its something we must all try our best to learn! From facing the Kaaba /qibla to detailed images of each step we have tried to cram in as much as possible to make this the best Islamic app you have ever used ! This guide will inshallah help you to improve your fajr, zuhr, asr, magrib/mahgrib and Isha namaz. Have fun and remember to keep practicing and doing dua and asking Allah to help us all improve in our namaz! An early eid present from the App Pilot team!